Are you stiff or sore? Do you feel the effects of aging or injuries? Would you like to improve your ability to ride your horse or run with your dog? Did you know that you can LEARN your way out of pain and limitation? And, as a Feldenkrais® Practitioner, I can help you do just that. Using the gentle, holistic Feldenkrais Method®, I can help you discover the movement habits or blind spots that may be creating your pain, stiffness or anxiety. Then together, we’ll explore how you can move in healthy, pleasurable ways that can restore lost function and alleviate your pain and struggle. In a nutshell, I can teach you how to use mindful movement to increase your vitality, ease and enjoyment of life. You’ll likely find improvements in your flexibility, posture, coordination and balance. While my private sessions are open to all, I specialize in helping improve the performance of equestrians of all levels and disciplines, from weekend trail riders to world-class dressage and jumper competitors. I also have a strong interest in working with horse and dog lovers who wish to learn how this gentle, hands-on approach can improve their animals’ health and athletic performance too. I teach clinics and workshops for horse and dog enthusiasts both nationally and internationally, and I’ve maintained a private practice in Encinitas, California for over 20 years. 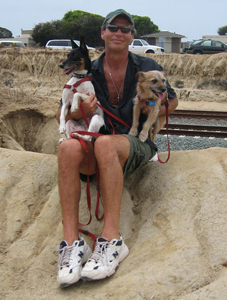 If you don’t live in Southern California, consider vacationing in the beautiful coastal town of Encinitas. It’s a wonderful opportunity to benefit from a few days of potentially life-changing, one-on-one Feldenkrais® sessions with me. With over 25 years of experience helping improve the performance and partnership of horses and riders, a series of unmounted sessions over a few days can dramatically improve your riding and well-being. No horse required! Please email me to find out how I can help you take a leap forward in your abilities – at any age. I’ve also had great results helping equestrians enjoy a secure, balanced, elegant position through online sessions. So no matter where you live, help is just a click away. Please email me so that we can discuss your situation. I’m here to help. Whether we see each other in person or online, I’ll make sure you get the VIP Experience. I can’t wait to meet you! A former computer analyst plagued with aches and pains, Mary made the leap into her dream career – enhancing the well-being of animals and their people – over 20 years ago. And she’s never felt better! She’s helped thousands of dogs, cats, horses and humans overcome challenges such as arthritis, hip dysplasia, stroke, injuries, aging and anxiety. Mary’s award-winning book, Grow Young with Your Dog, details inspiring stories of Mary’s work with dogs who recovered against all odds. 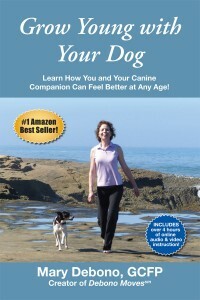 Her book also contains innovative exercises so that readers can learn how to help their dogs – and themselves – attain a youthful resiliency in mind and body. Mary Debono knows the pain of growing older. When Mary was a computer analyst working in Manhattan and Princeton, she suffered from carpal tunnel syndrome that resulted in nerve damage. Surgery and physical therapy offered no relief. Mary also had a very painful hip and stiffness in her back and neck. As she was rubbing her sore lower back one day, Mary thought, “Well, I have to expect this. I’m getting older.” But she was only in her late 20’s! Like a lot of people, Mary thought she had to expect increasing discomfort with each passing year. What’s amazing is that although quite a number of years have passed since that day, Mary feels younger now than she did back then. Mary began to study holistic approaches to health, most notably the Feldenkrais Method®. She learned that when we stay stuck in our habitual ways of thinking and moving we get physically stuck too. When Mary released the habits that kept her stuck in unhealthy patterns, she learned to move, think and act in different ways. Mary began feeling younger by the day. Her aches, pains and limitations vanished. Grateful for her own transformation, she was eager to help others feel better too. So she loaded her Appaloosa on a horse trailer and headed across the country to San Diego, California. There she enrolled in a four-year program to become a Certified Feldenkrais® Practitioner. Combining her Feldenkrais studies with her knowledge of animal bio-mechanics, behavior and training, Mary developed a hands-on approach that helps the animal and human feel better at the same time. She calls her approach Debono Moves*. For the past 25 years, Mary has been using Debono Moves to help animals and their people move well despite challenges such as injuries, arthritis, hip dysplasia, aging and anxiety. Her clients have ranged from severely disabled dogs and cats to world-class equine and human athletes. Debono Moves is designed to generate well-being and vitality in humans and their animal companions. Useful for all ages and physical conditions, Debono Moves can help individuals move more freely, minimize the effects of aging and injury, improve athletic performance and enhance communication and harmony between human and animal. Mary travels internationally to teach people how to use Debono Moves to accelerate learning, re-balance mind and body, and deepen the human-animal bond. Mary wrote her award-winning, Amazon bestseller, Grow Young with Your Dog, so that dogs and humans all over the globe could benefit from her experience. Mary was honored when Grow Young with Your Dog won the 2015 San Diego Book Award for Best Health/Medicine Book and was a silver medalist in the 2015 Living Now National Book Awards. Click here to watch Mary’s book trailer video. 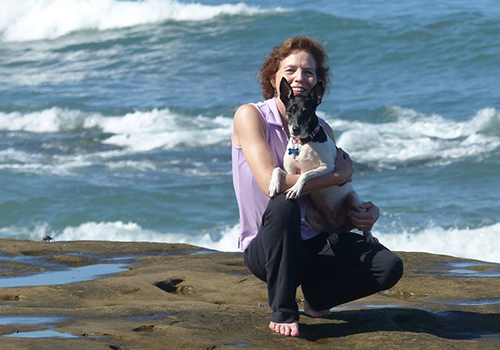 In addition to teaching canine and equine Debono Moves workshops internationally, Mary maintains a busy private Feldenkrais Method® practice for people in the beautiful coastal town of Encinitas, California. Her unique work has been shown on TV News and in newspapers and magazines. 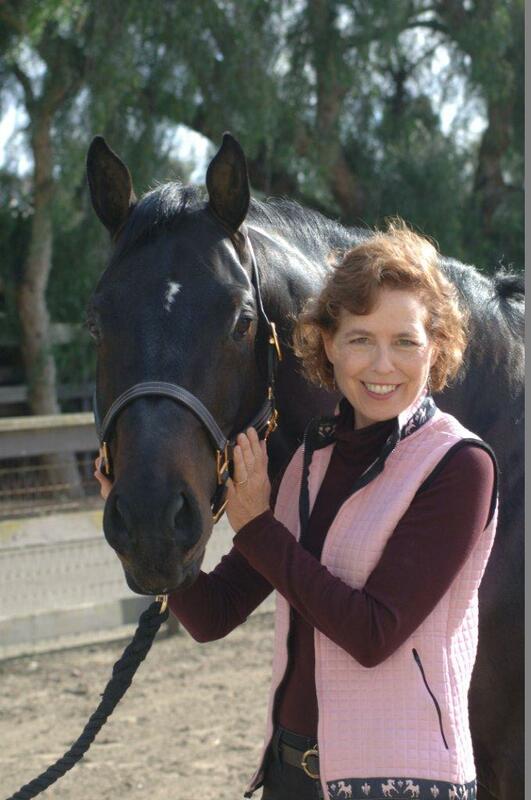 An enthusiastic speaker, Mary was a featured presenter at the Pacific Hoof Care Practitioners (PHCP) 2018 Conference, CHA (Certified Horsemanship Association) Conference, PATH Int’l Conference, regional Feldenkrais annual conferences as well as the Norco Horse Affair. Mary and her Feldenkrais Practitioner husband, Gary Waskowsky, have created Feldenkrais videos that are popular with equestrians and other athletes who want to improve their flexibility, coordination and posture. (Scroll down Products page to see videos.) Mary is also working on her next book, Grow Young with Your Horse. An advocate of positive reinforcement training for all animals, Mary’s bay quarter horse is an example of how a fearful, previously-abused horse can develop confidence through the skilled use of food rewards. You can see videos of Mary and Breeze playing together, as well as other educational videos, on her YouTube channel. Mary and her husband stay young by playing with their energetic rat terrier Ruby, spirited quarter horse Breeze, and laid-back cat, Higgins. Mary welcomes inquiries for speaking and teaching engagements. She can be reached at Mary@DebonoMoves.com. Please consider signing up for our newsletter to receive free articles and videos on how you and your animals can grow younger each day! For more information about Mary, please visit our Media Page. Remember, my business is to help YOU and YOUR animals thrive. Please let me know how I can help. Thank you for stopping by! *Debono Moves was previously called the SENSE Method. Gary Waskowsky has been a movement and awareness educator for over 20 years. He has a degree in Psychology and is a Guild Certified Feldenkrais® Practitioner. His experiences include performing djembe with African master Mamady Keita and studying shamanism with renowned anthropologist Michael Harner. Gary enjoys teaching the art of manifesting high performance states in individual and group sessions at Debono Moves workshops and in private practice. Heartmath biofeedback and Neuro-Linguistic Programming are part of the eclectic approach he offers his clients. He has taught in hospitals, health clubs and physical therapy clinics. Gary’s development of Rollercise™ has provided a simple, fast and effective approach to relieving back pain while improving posture. He also has audio and video products available for download. Gary considers his work to be part of the Global Shift towards coherency and truly living our purpose.